Thank you to everyone who donated to the PATH Intl. Disaster Relief Fund in the aftermath of Hurricane Isaac. You have contributed $375 for the fund in the last two weeks. Click here to donate. PATH Intl. is committed to understanding the value you place on your membership. Our goal is to provide you with programs and services you find valuable in the equine-assisted activities and therapies industry. To accomplish this goal we need your participation in this Member Satisfaction Survey. Please click here to complete the survey. The results will factor in to the association's new strategic plan, which is critical to the future of the association. The PATH Intl. Board of Trustees will lead this process at the PATH Intl. conference in Bellevue, WA, this fall. 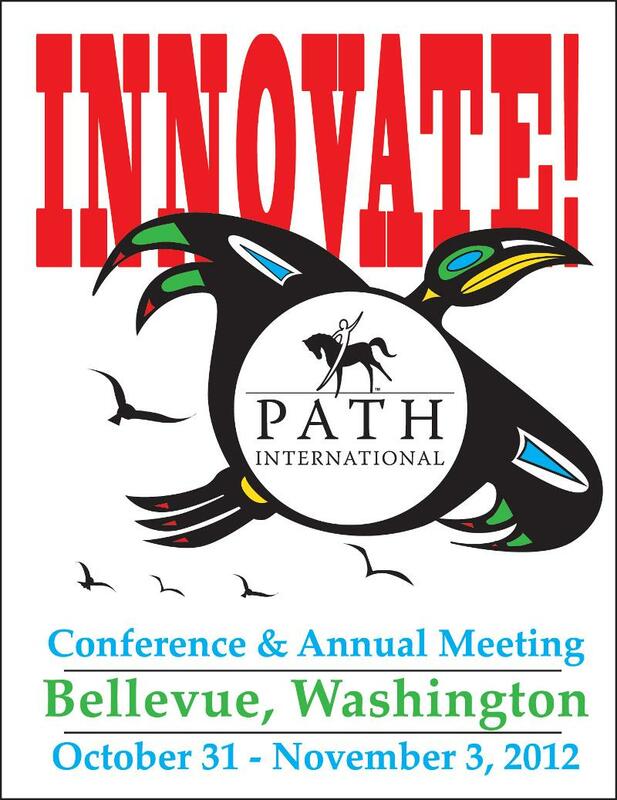 Your response will place your name in a drawing for a free registration to the 2013 PATH Intl. Conference in Orlando, FL, November 2013. Your participation is crucial as we strive to improve the value of PATH Intl. to its members. Let your voice be heard. Your opinion counts! Come escape the routine and join PATH Intl. 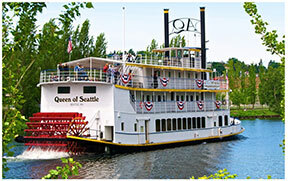 aboard the "Queen of Seattle" for a relaxing steamboat cruise. PATH Intl. has reserved this exclusive tour for its conference attendees on Wednesday, October 31, from noon to 4 p.m., as we officially kick-off the 2012 PATH Intl. Conference and Annual Meeting. The deadline to sign up for the paddle boat tour is September 25. In order for the tour company to run the cruise at the reasonable rate of $42.50 per person, a minimum of 100 people need to sign up. So register today for the paddle boat tour. If you have already picked your sessions for the conference and paid your registration fee, contact Karen Province to add the paddle boat tour to your registration. Last year's live auction during the banquet was so successful that we are doing it again. This year, we are excited to offer a "Live Travel Auction!" Keep watching your email for more details on the live auction and a few featured silent auction items. Log In to PATH Intl. Community Connections! Not sure how to log in to PATH Intl. Community Connections? There are two ways to log in. Choose which one works best for you. 1. Go to the PATH Intl. website. Scroll down on the left menu until you see the Community Connections banner. Click on it and log in, using your email address and password. If you are unsure of your email address or password, please contact the PATH Intl. office. 2. Go to the PATH Intl. website, log in to your account at the top of the page using your email address and password. Then, click on My Account and then PATH Intl. Community Connections. If you have any questions about logging in to PATH Intl. Community Connections, please contact Rachel Davis or call her at (800) 369-RIDE (7433), ext. 103. PATH Intl. Community Connections invites you to the pre-conference event hosted by members for members! It's a chance to bring PATH Intl. Community Connections to life with in-person opportunities to learn from other professionals in the industry. Sessions are designed and facilitated by a variety of community groups. Attendees are welcome to attend up to three presentations from the following schedule. For more information on PATH Intl. Community Connections Day, click here to read descriptions of each section, or log on to PATH Intl. Community Connections. The cost for the entire day (lunch included) is $75 for PATH Intl. members. There is still time to vote for the Membership Oversight Committee Representatives for Regions 2, 4, 6, 7, 8 and 10. The deadline is September 30, 2012. Your vote is valuable to the future of your association. Click here for the ballot, which also contains bios of the candidates. Thank you! PATH Intl. welcomes these centers that joined PATH Intl. in August 2012. If you want information on center membership, contact Karen Province. In order to understand stress in our horses, we need to look at how horses would live naturally without human interference. They would live in a herd, eating small quantities and often as they grazed on pasture. We would see them using fight or flight as a means of protection against predators. EQUUS Foundation, a PATH Intl. 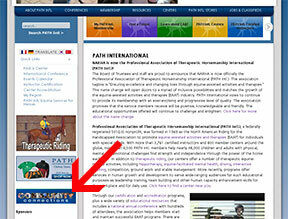 sponsor that helps unwanted horses to be rescued and retrained, has been selected by Animal Planet for the R.O.A.R. campaign (Reach Out. Act. Respond.). You can help put horses and their welfare at the top of the R.O.A.R leader board by sharing this campaign via Facebook. Simply share the link with your friends and family to give the horses a voice. Currently, the EQUUS Foundation is leading the way in social media for September, already accumulating over 180 "shares." With your shares on Facebook, the EQUUS Foundation can earn the additional monthly $2,500 bonus for having the most shares and giving the loudest R.O.A.R. PATH Intl. Is Working for You! The PATH Intl. mission is to be a global authority, resource and advocate for EAAT. To that end a task force has been formed that is working for you to review the certification system and processes. A diverse and inclusive group of volunteers comprise the task force, led by long-time member and past board of trustees president Teresa Morris. Other volunteers represent all current PATH Intl. certifications, including riding (Sandy Webster and Patti Coyle), driving (Tina Bennett), vaulting (Alison Plaza) and equine specialist in mental health and learning (Memree Stuart). Other groups represented include AHA (Janet Weisberg) and EFP/EFL (Leif Hallberg). Oversight Committee representatives include Certification Oversight (Marsha Anderson) and Education Oversight (Lynn Petr). Watch PATH Intl. eNews and PATH Intl. Strides for more information in the upcoming months about exciting developments. Congratulations to Harmony Farms, Inc., a PATH Intl. Center in Rockledge, FL, which has been nominated for the Central Florida Humanitarian Award. The Central Florida Humanitarian Awards were created to recognize outstanding individuals and organizations that dedicate their time, talent or treasure to help people in need locally and around the world. All nominees will be honored at the Central Florida Humanitarian Awards Gala on Thursday, November 8. "This is a very special award to us as it recognizes the impact and effect of equine assisted activities and therapies," said Pamela Rogan, founder and executive director of Haarmony Farms. "It also recognizes the hard work and support we have received from our great volunteers, riders, parents, families, friends and the community. This is our 20th anniversary year and I could not think of a better honor to receive at this time." The next Best Practices for Equine Care webinar is October 19. Attendance is limited to 25 per session so please register now through the PATH Intl. online store.